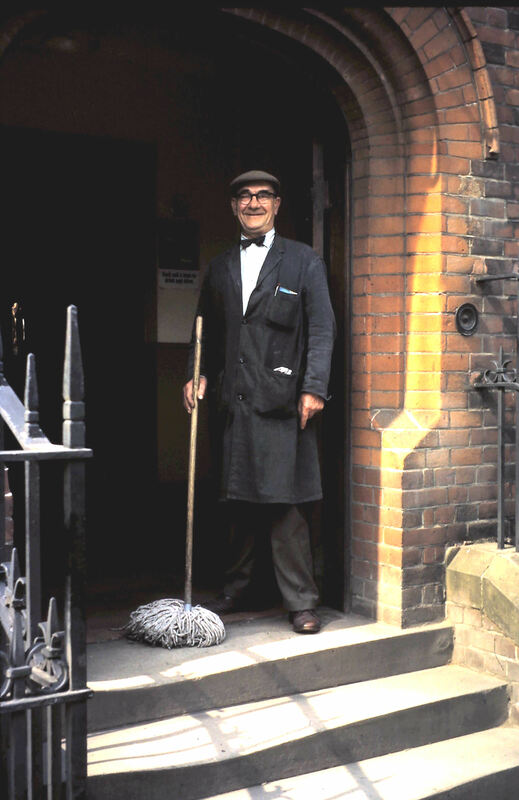 This picture shows Frank Swallow, the cleaner at the police station in Castle Street, Hertford, standing at the main entrance in May 1965. Frank was the cleaner when I was a cadet at Hertford between 1959 and 1962: I have a vague recollection that he was a retired police officer. The picture was taken by my father, William “Bill” Weeks who was the Borough Surveyor for Hertford Borough Council from 1947 to 1974. As such he had regular contact with the police. In the 1950s the town had one mechanical road sweeper which could only sweep the nearside gutter. Early one morning, about 6.30, I think, the driver was reported for travelling the wrong way along Maidenhead Street (a one-way street) whilst sweeping the offside gutter. My father spoke to Inspector Ted Pegg, officer in charge of Hertford section, and common sense prevailed.